HELENA, MONTANA – A coalition of conservation groups, Native Americans, and Montanans filed an urgent motion for injunctive relief in federal court today to prevent a repeat of the 2008 slaughter of over 1400 wild bison captured on public wildlands near the border of Yellowstone National Park in Montana. 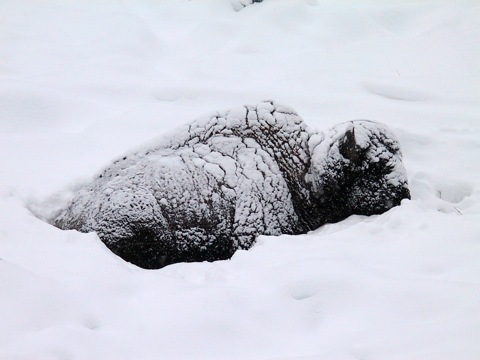 Many of the same factors that contributed to the mass slaughter in 2008, including heavy snowpack, bison population size, and the continuing agency intolerance for migrating bison, are in place this year as well. With the Stephens Creek bison trap inside the Park already near capacity, and more bison migrating toward their natural winter range in Montana to forage at lower elevations, Park Service Spokesperson Al Nash indicated that the agencies may begin sending hundreds of bison off to slaughter whether they carry the disease brucellosis or not. While it is concern over the possible transmission of brucellosis to cattle that is the justification offered for preventing bison from utilizing their winter range in Montana, at the present time there are no cattle present in the bison’s winter range corridor, and no risk of transmission. And that, according to the Plaintiffs challenging the bison management plan in federal court, perfectly illustrates why the plan needs to be scrapped.